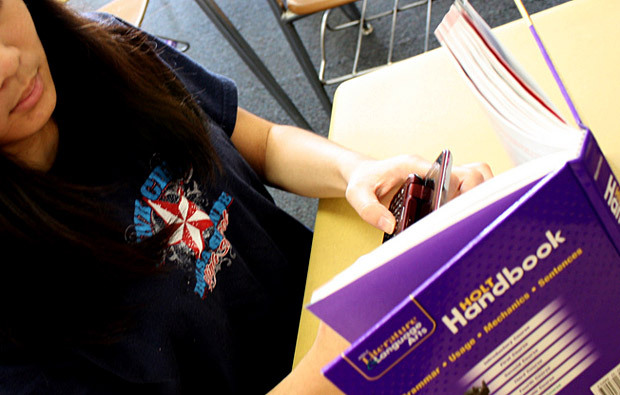 A new survey by textPlus reveals that texting in the classroom is more rampant than ever–for both students and parents. The days of getting caught talking in class are over–and so aren’t the days of even getting caught. According to a new survey by app developer textPlus, which surveyed more than 600 of its users aged 13 to 17, texting is more rampant than ever in the classroom. A whopping 42.5% of teens admit to texting during class, and more than half of those say they text sometimes or constantly. What’s more, nearly 80% of students say they’ve never gotten in trouble for texting during class, suggesting the eyes-down, cell-under-the-desk method is slipping past even your most yard-stick taunting school teachers. Touch to class, isn’t it time schools start cracking down? And if technology is to become more a part of education, how will teachers ever track students who are already able to pull off using these devices when they’re not supposed to? As more and more gadgets enter the classroom, won’t it just make it easier to find distractions? of a print or digital textbook,” according to a company statement. Can you imagine how kids will game the classroom once they have the full-might of the iPad’s app store? How will teachers ever keep up when they can’t even keep up with cell phones? Part of the problem is that kids don’t feel guilty for their actions. Roughly 74% of students don’t believe it’s wrong to text during school time, a mindset which permeates not just learning but homework too: About one in three teens admit to using text lingo (e.g. “u” or “4” or “imho”) in written school assignments. How do we change this? Perhaps we start with the parents: A shocking 66% of teens report that they’ve received texts from their parents, even when their parents know they’re in class. For teachers who spend hours and hours a day updating Excel spreadsheets with student data, Houghton Mifflin’s app may be a blessing–for students, who yearn for even more distractions, this might be a godsend. Of course, we’re excited for the positive impact technology can have on education, but if textPlus’s survey provides any indication of how well iPods and cell phones are monitored (T-Mobile’s promotion announced this morning won’t help), schools and teachers have a long way to go before getting their students to use iPads correctly in the classroom.